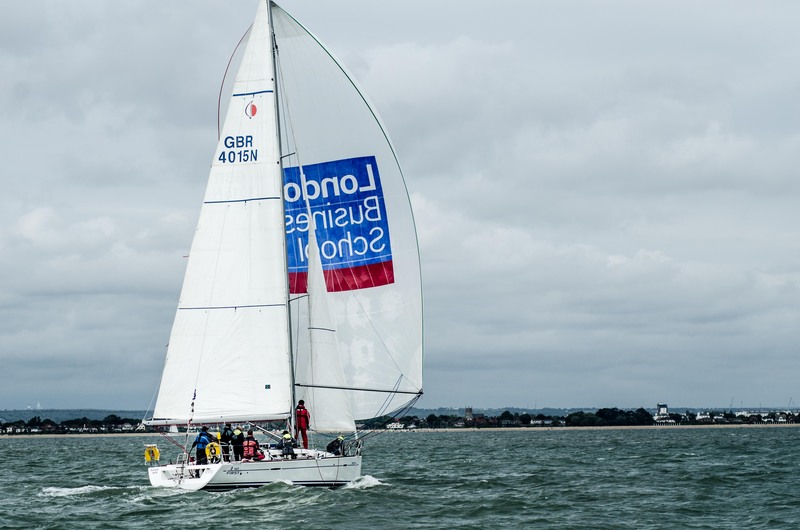 London Business School retained the Cranfield Regatta trophy in fine style, winning all five races to score a perfect four points (including discard). The rankings leaders brought their A team and their A game to the regatta, following their disappointing performance at the ABC in France. Home team Cranfield 3 came second with three second places in the last three races, while third- in- the-rankings Kellogg/WHU brought home third, coming second in the first two races. Bath and Cranfield 1 filled out the top five. the racing took place on the Solent, the stretch of water between the South coast of England and the Isle of Wight. Day one started with winds at 20 knots gusting into the high 20s, leading to poling out of the Genoa on the downwinds. Spinnakers came out by the end of the day, and Sunday was perfect Spinnaker- flying weather.